Apple Tuesday was granted a patent for a universal wireless dock that could help ease the minds of users who have accumulated their fair share of iDevice accessories over the years. Filed as U.S. patent number 8,280,456, the universal dock appears to feature a single media player connector, presumably a Lightning connector, with an adapter for 30-pin iDevices and even non-Apple media players. "For various reasons, these media players may have different sized connectors. For example, the media players may be made by different manufacturers," the patent stated. "Also, they may be made by one manufacturer, but a newer media player may have a more advanced, smaller sized connector receptacle." The key to the dock is a wireless transmitter, which will send a signal to a receiver plugged into any existing iDevice accessory to solve the current incompatibility problem. 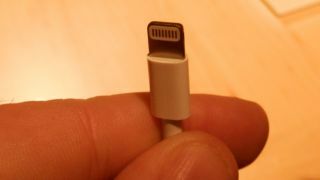 Apple drew the ire of many fans when it introduced the Lightning connector with iPhone 5, iPod touch, and iPod nano. The smaller, reversible 8-pin connector replaces the 30-pin connector of legacy iDevices, making the new tech incompatible with existing accessories. Apple already sells an adapter for $29 (UK£25, AU$35), but the newly patented dock could offer a more elegant solution by wirelessly connecting any iPhone or iPod to compatible speakers regardless of whether it uses a 30-pin or Lightning port. The patent seems to contradict comments made recently by Apple's Senior Vice President of Marketing Phil Schiller, who said that there were no plans to make an iPhone 5 dock in the works. It's possible that Apple is just covering its bases against a potential third-party dock, but with the number of 30-pin accessories out there it certainly wouldn't hurt for the wireless dock to surface as an actual product.